Friday I got “the” call. My Nikon D4 was in! As you would guess Friday was turning into the day from heck. More than anything I wanted to get out and start testing all the new features of the D4. But NO!!!!!! At 5:40 I dashed out to FBBR. At the very least I had to test the advertised increased focus in low light, i.e. shooting through a 2x teleconverter. When placed on the 600mm lens (f/4) the aperture then becomes f/8. Somewhat of a nightmare for focusing. Then add low light. Shooting after sunset, etc. When I finally made it to FBBR they had been closed for nearly an hour. Dang it! My only option was to go to the end of the road where there is a very large pond. I have shot there many times. The sun was just going behind the clouds and very soon would be set for the day. As I turned at the end of the road my eyes about came out of my head. Way out on the pond was a Great Blue Heron fishing. Not a typical place for them to fish. To much car and foot traffic. I think I set a new record for getting out my window mount, the 600mm lens, the 2x teleconverter and of course my brand new unused Nikon D4. I was still in my car and stopped well short of the pond when I saw the Heron. With everything mounted I creeped slowly in my car to the pond edge. Still about 60 to 70 yards away the Heron was getting nervous. I stopped. Put the Heron in the D4 cross hairs and watched. And waited. Had a few minutes to set the ISO and check the settings. At least the ones I knew. A new camera you know! 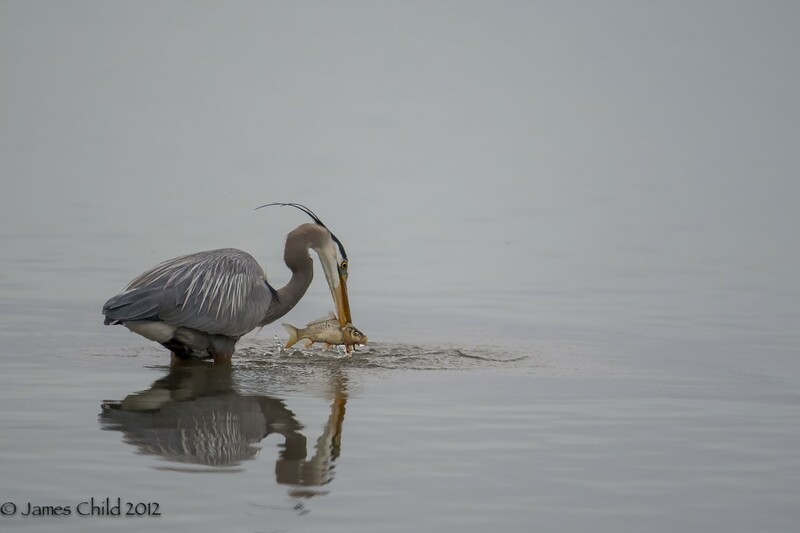 And right on que the Heron stabbed a huge fish. I was amazed at how fast the camera focused. At about 11 frames a second not much of the Heron fishing didn’t get captured. With the 2x converter the net optical length was 1200mm. The wind was shaking the camera. But to my surprise at about 70 yards, f/8, and a high ISO I got this beautiful capture…….